Rats are commensal rodents the numbers of which are influenced by our activities, buildings and the landscape we have created. The type, style age and size of our houses and gardens and what we do in them will impact on the number of rats. Some activities such as keeping chicken, feeding the birds and composting using an open heap may be beneficial to the rats while others such as keeping cats or terriers may discourage them. The main rat species in England is the Norway or brown rat, Rattus norvegicus. The Black rat, R. rattus, associated with the bubonic plague is less common in the UK being mainly restricted to ports or coastal towns where they forage in disused buildings and warehouses but thy are found in larger numbers elsewhere. Rat tunnels in the soil or at the base of the compost bin are often the first sign of infestation. The tunnels entrance is about 30-40mm diameter. may be visible where damage has occurred. Although many gardeners and composters will only see rats infrequently, if at all, a study conducted in central New York reported that pests, including rats, were the third most common obstacle to home composting (Tompkins County Compost Study. Prepared by: Cornell Cooperative Extension’s Compost Education Program 2001). Undoubtedly opening a bin to find a rat sitting on the composting looking at you can be a disconcerting even if it only happens once. While rats may visit, or nest in, a compost bin if they are already present in the area composting does not generally attract the rats in the first place. The Norway rat creates burrows and makes “rat runs” along building foundations, garden fences and walls. They will also burrow beneath chicken houses, woodpiles, manure and compost heaps. Nests in compost heaps or bins may be lined with shredded paper, other dry material from the heap or material brought into the bin. The contents of the compost bin make a good restaurant for brown rats as their preferred diet includes cereal grains, nuts, and fruits, meat and fish. The Black rat seldom digs burrows preferring to nest in locations off the ground in dense vegetation, shrubs, trees, vines etc. They also eat a range of foods that might be found in the compost bin. There preferred diet consisting of fruits, nuts, berries, slugs, and snails. Rats are attracted to compost bins and heaps as a source of food, shelter and as a warm dry place to nest. The compost bin will be particularly attractive during the winter as it can provide warmth and a good supply of food with kitchen scraps being regularly added to the top while the material in the lower part of the bin is relatively undisturbed. Rats need to gnaw hard surfaces to keep their teeth under control as they grow throughout their lifetime so many wooden and some plastic bins will offer little obstacle if the rats smell the decomposing food inside the bin. In this following sections I will look at measures to reduce the risk of rat infestation in conventional bins mounted on the ground i.e. wooden New Zealand bins or Ground mounted plastic bins. The use of “off the ground” fully-enclosed tumbler bins will usually prevent rodent access, but they tend to be expensive and more challenging to use. Leptospira is spread in rats' urine and can survive in water for several months which plays an important role as a source of transmission of leptospirosis to man and other animals. There is a small risk of catching Weil’s Disease from contact with soil or compost contaminated by rats but by far the highest risk is to farmers and vets is from contact with infected urine or blood followed by fishermen, water sports enthusiasts following contact with contaminated. In the UK the risk to humans is small with less than 40 cases reported in England and Wales every year. However, it is probably a good idea to wear gloves when handling garden compost and to cover cuts or grazes. Temperatures below 4°C and above 37C° will kill Leptospira which favours an optimum temperature of, or about, 25˚C, a moist atmosphere and a pH near neutral. So is likely to survive cold composting but will be killed by hot composting at 40-60˚C. However, if introduced by rats later in the composting process when the compost has cooled during maturation it may survive. In general compost does not present a problem as even if rats have contaminated the bin. 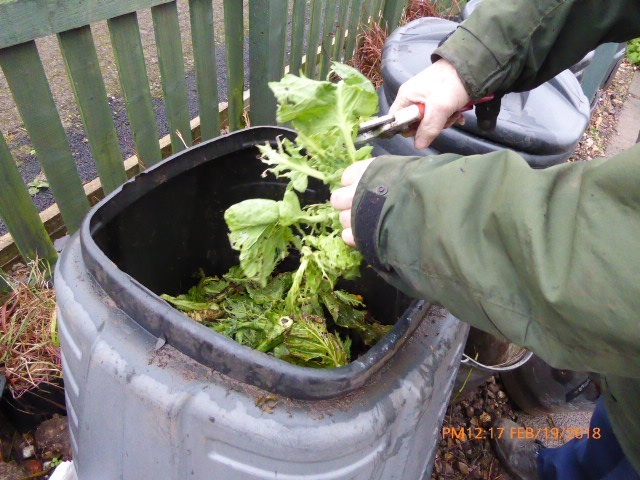 Once the compost is applied to and mixed with the soil, the level of bacteria will be so low that vegetables grown in it will be safe to cook and eat as normal. However, if a cold compost bin or heap is known to have been rat-infested it might be advisable to use the compost in the flower garden or as a mulch round established trees. It is best not to use it round low growing fruits or vegetables that are going to be eaten raw and the edible parts may be in contact with the soil or compost e.g. radish, celery, cucumber, strawberry. Vegetables, fruit and herbs should always be washed Temperatures below 4°C and above 37C° will kill the leptospira bacteria. 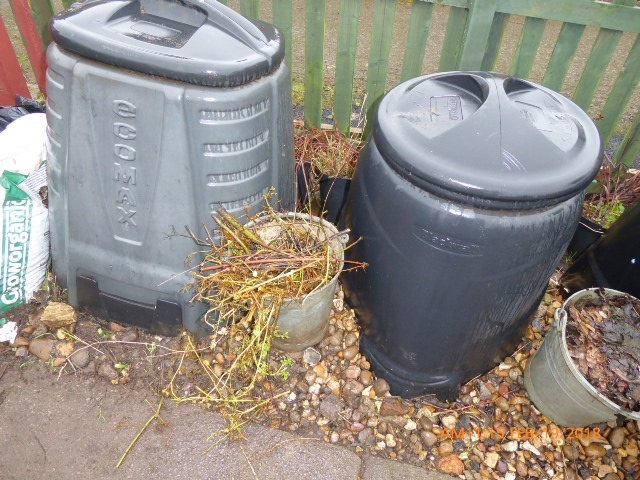 As the brown rat prefers to move along runs close to walls, fences hedges, etc the bin should be positioned in the open away from potential rat runs. The advantage of leaving an open space round the bin also makes it easier to check for future burrows. As black rats like trees and shrubs it is best to place the compost bin away from these and if trees do overhang the bin cut the branched so that they do not provide a means of reaching the bin. It is generally accepted that rat infestation of the compost bin will be linked to the composting of cooked foods, meat and fish. Some composters even recommend washing egg shells to reduce the smell before adding them to the bin. While these are undoubtedly attractive to rats other kitchen waste such as fruit and vegetable peelings also provide appetizing meals once the rats have gained access. It seems that rats are quite keen on potato peelings and the smell of decomposing fruit certainly seems to attract rats to many school compost bins and food digesters. However most allotment growers will testify that rats will also be attracted to bins containing plant trimmings and weeds. If it is accepted that there will always be some rats in the garden it will be necessary to use physical barriers to prevent access to the compost bin. Laying a solid concrete base provides a solution to this problem it also makes it easier to shovel up the compost from the bottom of the bin. Ideally the base should be sloped slightly so that the leachate runs into a gulley leading to a buried bucket so that it can be harvested for use as a compost activator or liquid feed. Paving slabs can also be used to provide a less permanent solid base. These must be laid touching each other so that the rats cannot gain access between them. Standing the bin on a layer of pepples to make it more difficult for the rats to burrow below or round the bin. A weldmesh or plaster mesh base can be fitted across the bottom of the bin. Chicken wire is not recommended as the rats may chew through it. The mesh size is important as rats can get through gaps of 15 mm. The advantage of wire mesh over concrete stands is that it allows worms access and makes drainage easy, although the leachate also drains away. Traditionally a bin would have been covered with a tarpaulin or carpet and more recently a compost duvet but to keep rats out a secure, tight-fitting lid is necessary. 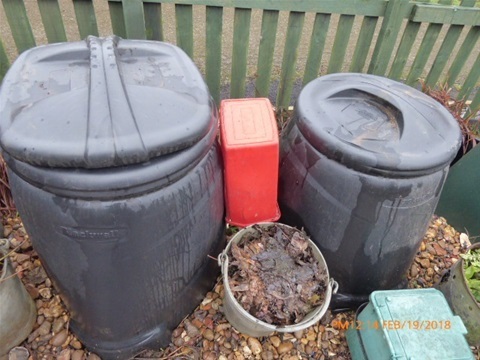 With square bins where the lid pushes or drops into place, rather than the dustbin type of lid which fits over the rim of the bin, it is necessary to ensure that there is no gap between the sides and the lid to avoid rats gaining access or finding a gap that they can enlarge. As an additional precaution, against rats and strong winds, the lid may be held in place with a bungie cord. A solid-sided bin is obviously more secure than an open-slatted one. Wooden but open-slatted bins can be made rat proof by lining the inside with wire (see below) or making a separate removable mesh frame that can be attached to the outside. This can be removed for cleaning when necessary and retains the air flow which is one of the reasons for buying an open slatted bin. The risk of infestation can be reduced by lining the inside of a wooden bin with galvanised, 13mm x 13 mm (0.5 x 0.5 inches) wire mesh. If the bin consists of separate boards which can be lifted out one by one fixing mesh will mean that the boards will have to be removed as a single sheet. To avoid this the mesh can be fitted to a separate frame and fixed to the outside. If there is not a solid concrete standing the mesh should also cover the base. The lid should also be lined with wire. Rats will be attracted to the bin by the smell of the decomposing contents and the chance of a ready meal. As mentioned earlier the standard advice is not to compost cooked food, meat or fish. Although fruit and vegetable peelings also offer rats a meal excluding these would defeat one of the purposes of composting reducing waste sent to landfill. Cooked food waste, meat, fish, cheese and bread can still be composted but in a special “food compost bin” (Composting Food). Cooked food can also be fermented using a Bokashi system (Bokashi bins) and the finished product added to the compost bin. Rats do not appear to like Bokashi pickled food. Other scraps and peelings should be buried in the pile or covered with a layer of browns e.g. shredded paper, cardboard or dried leaves soil or finished compost. This also reduces the number of fruit flies. If rats continue to frequent the bin once cooked food is no longer being added it would suggest that the vegetable and fruit waste is now part of their diet. In such cases it will either be necessary to stop adding these items and compost only garden waste or to empty the bin and take some of the other measures mentioned here. Eggshells are also said to attract rats they differ from the other materials that are normally composted having a high mineral content rather than being wholly organic. Therefore, they are a good source of calcium, on average 2.2 grams for each dry eggshell. Unfortunately, egg shells have been linked to both rat infestation of the compost bin and may carry Salmonella organisms although the likelihood of catching it from food grown in compost is minimal. The likelihood of rat infestation can be reduced by allowing the shells to dry out for a few days but to further reduce the risk of rat infestation and Salmonella it is better to bake them in an oven for 20 minutes at 121C (250 F) before crushing them and adding to the bin. If you have a rat problem, do not focus solely on the compost bin. While it is good to have a wildlife friendly garden it does not want to be to welcoming to rats. Keep the rubbish and recycling area tidy and any wild bird or chicken food stored in suitable containers. Seal access to the area under chicken houses, sheds and decking or mount the chicken house a foot or two above the ground. Do not leave chicken food out at night where rats can get to it. Do not store stacks of bricks near the compost area. Thick vegetation, especially ground cover plants provide cover for rats as well as the ground, try to keep these clear of the composting area. Birds are messy eaters and they tend to scatter bird seed over the ground round the feeding station. Paving the area round the feeders makes it easy to sweep up the waste seeds. It may be a case that having an occasional rat in the garden is the price we have to pay for having a wildlife friendly garden and it is simply a case of learning to live with it provided the rats keep out of the compost bins. When researching this item, I came across some reports on compost and gardening forums that might be worth trying. Plant Mint. Rats and mice apparently dislike the smell of mint and it is suggested that planting mint near the bin will act as a rat deterrent. Sprinkle Cayenne pepper round the bin as a rat deterrent. Some have indicated that human urine, paraffin soaked rags and mothballs added to the bin also acts as a deterrent, but I can find no peer reviewed evidence for this and rats do live in sewers which I understand do contain urine. Urine does make a good activator so still add it. The red containing shown next to an allotment bin is used for urine (diluted 1:20). It is recommended that the container is filled in the shed or other private area. The Campaign for Responsible Rodenticide Use (CRRU) has produced a code of good practice on rodent control. This should be followed whenever rodenticides are used. further information is available from the Think wildlife website www.thinkwildlife.org.uk/.